A NASA spacecraft is fine-tuning its approach to an icy comet and has already snapped photos of it ahead of a planned Valentine's Day visit. The space agency's Stardust-NExT mission is just one week away from zooming by the comet Tempel 1 Feb. 14 to see what's new since the comet was last visited by a spacecraft in July 2005. Comet Tempel 1 is a ball of ice and rock that orbits the sun every 5½ years. Scientists say the spacecraft is on track for next week's encounter after firing its thrusters last week to refine its path. "Encountering something as small and fast as a comet in the vastness of space is always a challenge, but we are very pleased with how things are setting up for our Valentine's Day flyby," Joe Veverka, a Cornell University researcher and principal investigator for the mission, said in a statement. The Stardust spacecraft snapped its first photos of Tempel 1 Jan. 18-19 from distances of 16.3 million miles (26.3 million kilometers), and 15.8 million miles (25.4 million km), respectively. "This is the first of many images to come of comet Tempel 1," Veverka said. The upcoming rendezvous is a bonus mission for the Stardust spacecraft, which completed its primary goal in 2006 when it flew past comet Wild 2 and sent a sample of particles from its coma to Earth. The probe was launched in February 1999. The NExT mission stands for New Exploration of Tempel 1. Stardust will fly within 124 miles (200 kilometers) of comet Tempel 1 during its closest approach, which will occur at 11:56 p.m. EST on Feb. 14 (0456 GMT Feb. 15). 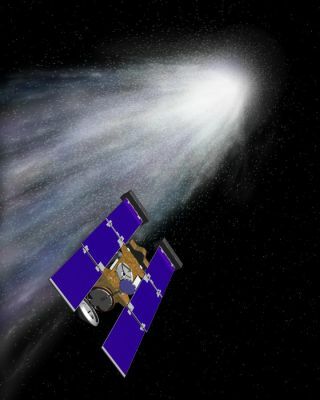 In addition to capturing high-resolution images of the comet's surface, Stardust-NExT will measure the composition, size distribution and flux of dust particles in the coma, the tenuous atmosphere around the comet's nucleus. Tempel 1 was visited by NASA's Deep Impact spacecraft, which deliberately sent one of its components crashing into the comet, then took photographs of the cloud of debris that spewed out from the impact. The mission was unable to get clear pictures of the newly formed crater because the dust cloud obscured the view. NASA hopes to complete that unfinished business by imaging the crater with Stardust-NExT. This second encounter with Tempel 1 also could teach scientists more about comets in general, and how they formed along with the rest of the solar system around 4.6 billion years ago. The Stardust-NExT science mission is operated out of NASA's Jet Propulsion Laboratory in Pasadena, Calif. Lockheed Martin Space Systems of Denver built the probe and manages the day-to-day spacecraft operations.